Friday February 2, 1923 Mrs Falk and I went down town early. Were at Mrs Lowes all day. They were sewing together. I wrote Hattie and Aunt Erma. We had callers in the evening. Saturday February 3, 1923 I rode down town with Mrs. Falk in the forenoon and we went down again in the afternoon. To a picture show. I wrote to Lydia. Was very tired and went to bed early. Sunday February 4, 1923 We went to SS and church and had a good dinner down town. I had three papers to read in the afternoon and wrote Cora & Warner McCall. The Falks had callers. 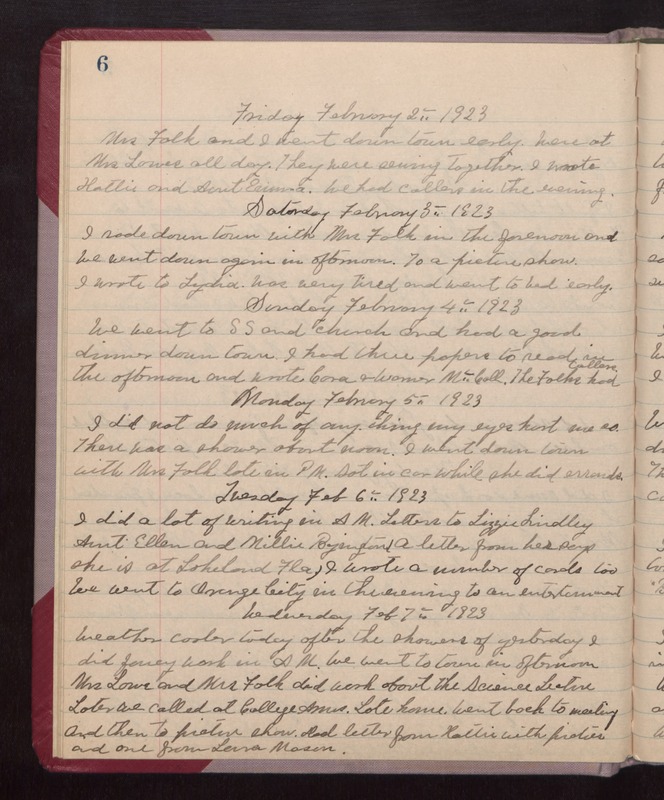 Monday February 5, 1923 I did not do much of any thing my eyes hurt me so. There was a shower about noon. I went down town with Mrs Falk late in PM. Sat in car while she did errands. Tuesday Feb 6, 1923 I did a lot of writing in AM. Letters to Lizzie Lindley, Aunt Ellen and Millie Byington (a letter from her says she is at Lakeland Fla.) I wrote a number of cards too. We went to Orange City in the evening to an entertainment Wednesday Feb 7 1923 Weather cooler today after the showers of yesterday. I did fancy work in AM. We went to town in afternoon Mrs Lowe and Mrs Falk did work about the Science Lecture. Later we called at College Armes. Late home. Went back to meeting and then to picture show. Had letter from Hattie with picture and one from Laura Mason.